Linda, Pat, Martin and I could not make the Chatsworth walk so we arranged an alternative of our own. We left the parking above the Polop Paradise urbanisation at 10.30am as we did not think anyone else would join us. Crossing a stream bed, we followed a rough track uphill through scattered woodland. After a brief stop for a drink the terrain steepened significantly. Progress was steady and height gain significant. Linda complained about the missing tea break due to no flask being brought. 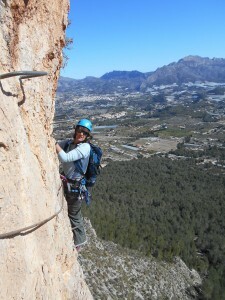 We had to move in single file as the route was narrow until we gained less steep ground. 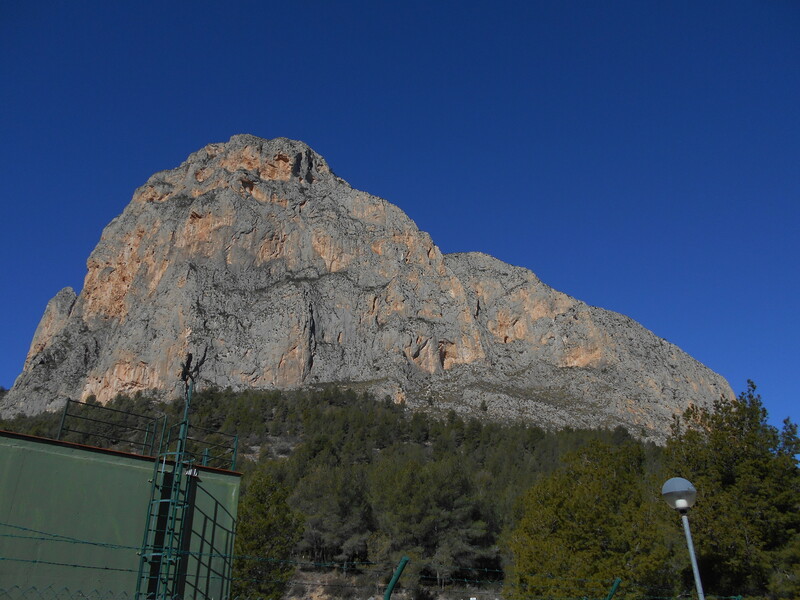 Here, Martin noted that it was almost one o’clock so we had a break for a drink and snack under a lonely pine tree. The wind was cool so we soon traversed acreoss the side of the mountain and scrambled downwards to steeper ground. 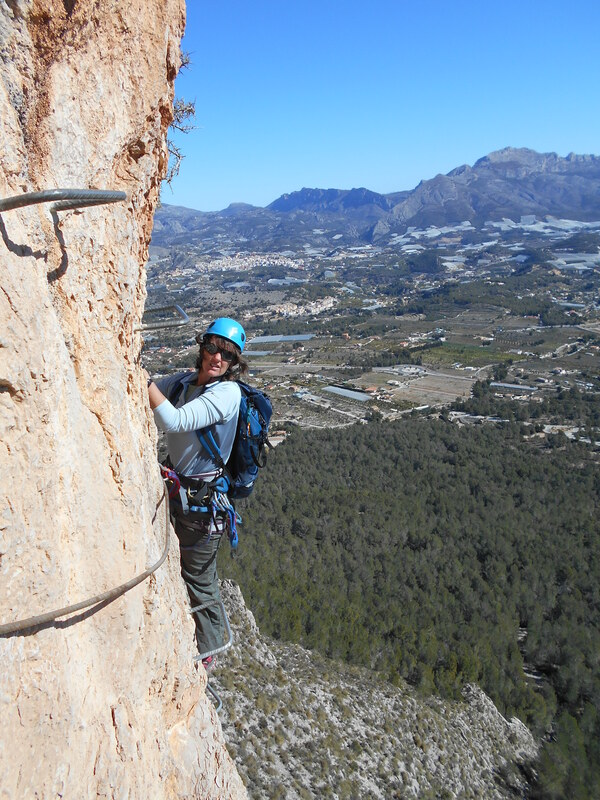 Pat questioned whether abseiling was allowed in ‘the rules’ for Thursday walks, but as we had no choice two abseils brought us back down to easier ground and the path back to the parking area. A select group but a great day out with no sign of rain or snow. 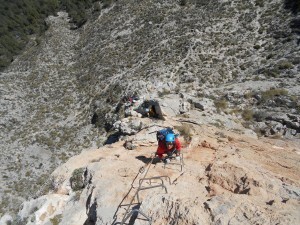 The report refers to an ascent of the via ferrata, which follows the obvious arete on the right hand side of the main face. The Ponoch is inland from Benidorm, Costa Blanca, Spain. Eight people assembled at Barber Booth (despite my wrong promise of mud. 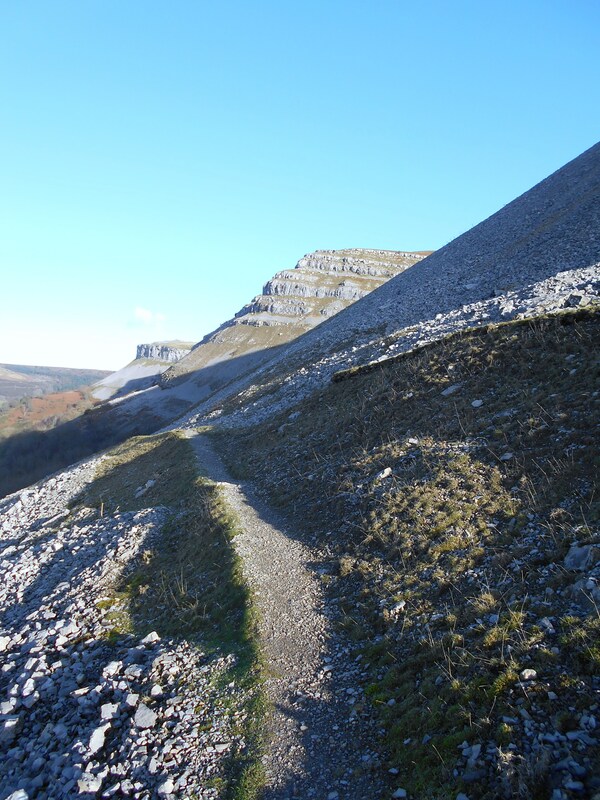 The walk across the fields to the start of Chapel Head Scar was only slightly muddy. The damage caused by off roaders on the main track was apparent A short break was taken before starting along the edge itself. Although it was overcast the views to either side were extensive. After passing Lords Seat (To answer Hugh’s question, It was built just before I was born.) we quickly arrived at Mam Tor summit, in very strong winds. We dropped down the other side and had lunch in a sheltered spot in the old earthworks. Still in strong winds and now with ice pellets for extra amusement, we dropped down to Hollins Cross and turned towards Edale. Foul weather caused the ‘zipping up of the jacket. Soon the ice stopped, the wind dropped and the walk back to the cars via Edale, across some slightly muddy fields was completed. A circuit well worth doing again for the historic sites and extensive views of the Peak District. We started with 18 humans and one canine, met another 7 humans for lunch, returned with 25 then were joined by 5 for tea, so a good turnout for this popular event in the club’s calendar. 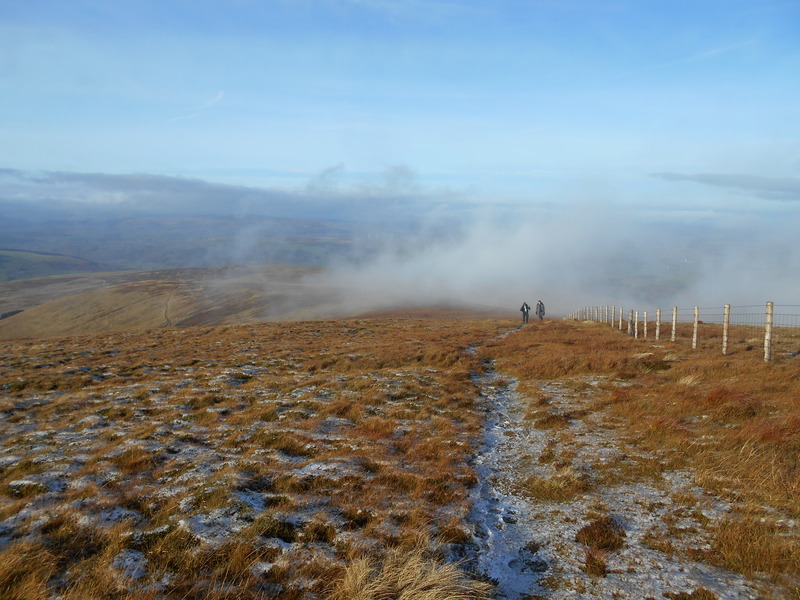 The route, according to the Gibson GPS, was 9.8 miles with 1700 feet of ascent – short for a normal Sunday walk but fine for a stagger on the shortest day of the year. A slight extension after lunch was declined by majority vote, with tea and cakes proving the stronger incentive. 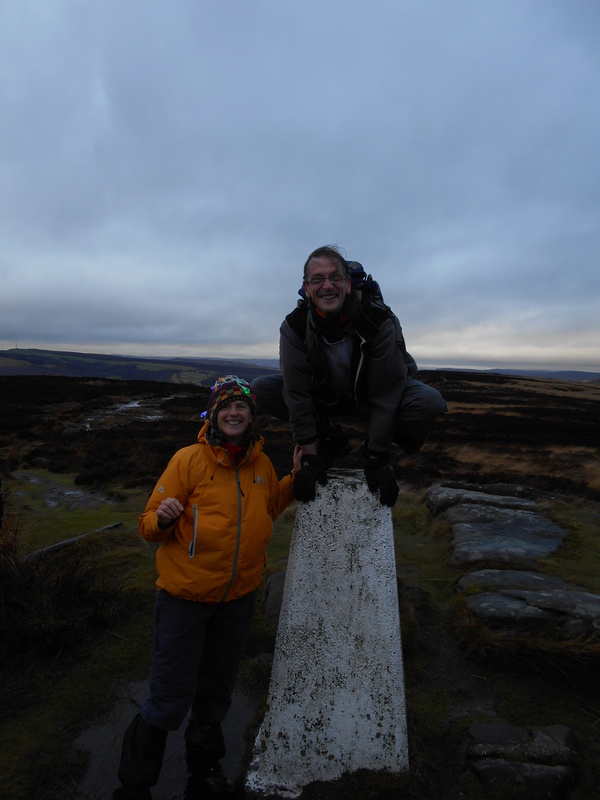 The weather proved better than forecast, with only light drizzle and mild winds, and the party made good progress from Crookes down to and along the Rivelin valley. 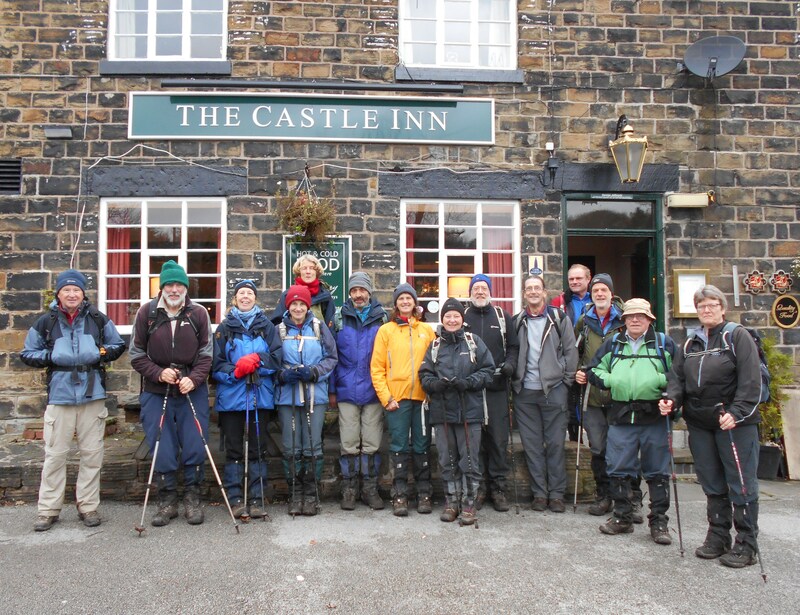 We had enough time for a coffee stop at the old corn mill site before the climb up to Lodge Moor and lunch at The Sportsman. The carvery was popular, along with the well-kept Landlord, allowing a comfortable wait for the 4-strong cycle party and those joining for the afternoon only. Return along the edge path was quicker than the outward journey, and we were back at Glebe Road by 3.30 to find that David P and Mary had already arrived by bike and had made the first brew! A pleasant social followed, with the club’s large teapot being refilled many times and much banter enjoyed. The popularity of the cakes meant that only a small dent was made in the mince pie mountain, much of which was redistributed among departing members. Many thanks to all who brought food, and to Chris H for a valiant day’s baking on Saturday. Happy Christmas and New Year everyone, see you in 2015. Eleven members left Foolow to follow field paths into Eyam. Once through the village our route took us past the Lydgate Graves and down The Cliff into Stoney Middleton. Although overcast, the views of the Eastern Edges were extensive from our coffee stop overlooking Stoney. We then descended into Coombs Dale and began the long gradual haul up the dale and onto Longstone Edge for lunch. Again we were treated to far reaching views over Monsal Dale, Great Longstone and Bakewell. It seemed appropriate at this moment to remember Harry Woods, an ex member of the club who passed away recently and whose funeral took place that morning. Before setting off, Maurice, in an attempt to lift the cultural tone of the day read John Masefield’s poem Cargos. Whether this has set a precedent for future walks remains to be seen, although it was generally agreed that anything longer than three verses would have to wait for warmer weather! We skirted the settling pond below Longstone Moor farm and followed more field paths through Housley and into Foolow. Unfortunately we couldn’t persuade the land-lady at The Bull’s Head to stay open long enough to serve us a festive cuppa, which would have nicely rounded off an excellent walk. A bit of a last minute parking panic for 2 late arrivals delayed the start slightly, but the full complement of 16 members were soon following the Don braving drizzle and general greyness as we walked through some of Sheffield’s old industrial heartland. The Don was in full flow and the weirs were counted.Goosanders were spotted and some members of the party had 3 kingfisher sitings. Rejoining the river after a detour round the Sheffield Forgemasters site, there were complaints about the lack of a tea/coffee stop -but as lunch was imminent we pushed on.Lunch was then taken close to the final weir by the side of Meadowhall,where the wooden perimiter posts surrounding the kids playground (conveniently closed) provided a suitable area to stop and sit. The general ambiance was enhanced by the adjacent Santa’s grotto complete with musical sound effects! Moving on after lunch we soon joined the Sheffield & Tinsley canal which led us back to the city centre where we finished by the Victoria Quays. A different walk to our usual Peak District locations,but not without interest and enjoyed -I hope-by all. 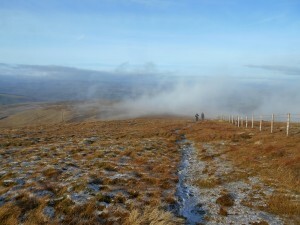 We all had a wind swept time on White Edge and views were suprisingly good, but the Grouse was beckoning. An excellent turn out of 16 plus 4 meeting us in the pub. This included our ‘senior’ member Charles, pictured wearing my Christmas hat! The pub coped extremely well, and we all got our food in plenty of time before the return leg. Sean read a very witty and appropriate climbing/walking poem, taking a leaf out of Maurices book!! We have had 48 walks this year with 12 different coordinators, so thanks to all of them. 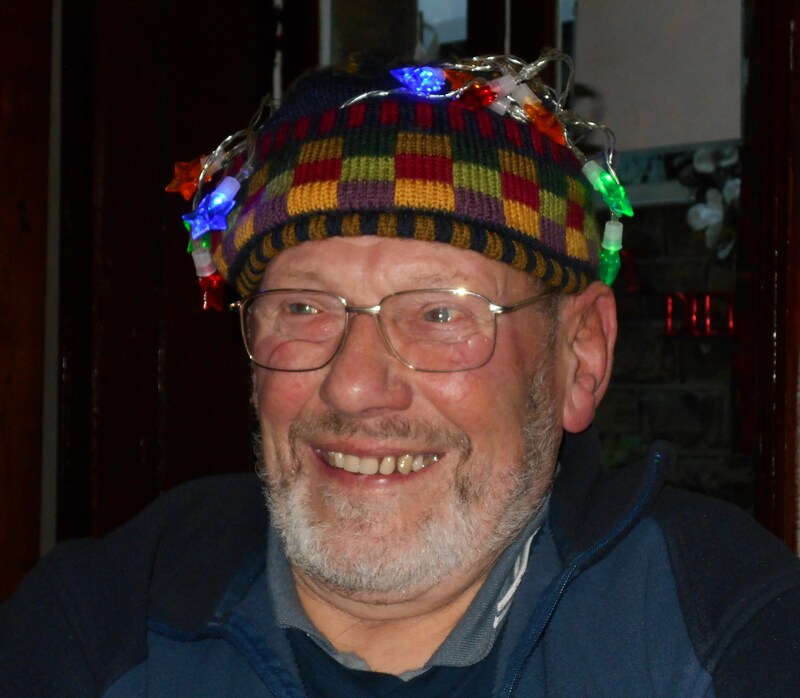 The big star award went to John Murton for organising a massive 9 walks this year, but he wasn’t there so didnt get his sloppy kiss- note John, Mike has your award to give you, probably without the kiss!. We have had a wide variety of walks this year :linear, tree, flower, boggy, sunny, scrambly, city, and a wide variety of locations to enjoy. We have had lots of laughs, and friendship. Here’s wishing you all a very Merry Xmas and hoping 2015 brings us health and happiness. Linda. 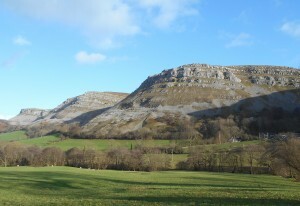 Twenty-five club members and two guests went to the Llangollen Hostel for the 2014 annual dinner meet. 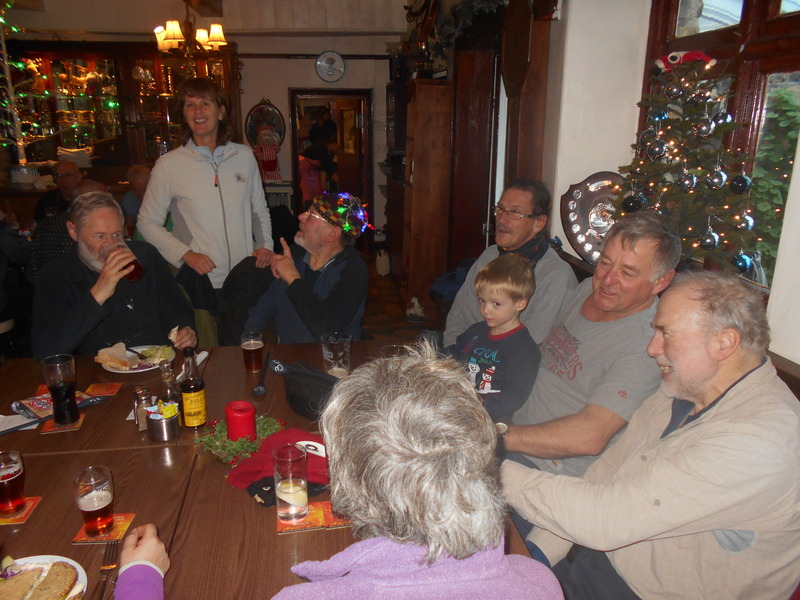 This was a new venue for the club and despite being a bit snug in terms of the sitting and dining rooms proved to be a very comfortable venue. Llangollen is surrounded by great countryside packed with outstanding views and, with the canal and Pontcysyllte and Chirk aqueducts, steeped in well preserved industrial history that are well worth visiting. On the Saturday (a cold but clear day) members variously walked, biked and ran round the surrounding hills and valleys (and aqueducts!). Back at the hostel club members and guests were lucky enough to have Marian once again in charge of the catering. Some members set to supporting Marian by preparing vegetables while in the spirit of too many cooks spoil … others felt it only right to support local breweries and nipped out for aperitifs. All were back for 7.15 and sat down to an outstanding three course meal. The meal was followed by David delivering the club president’s annual awards ceremony to club members who had an exceptional achievement during 2014 or had in a couple of cases bounced back from injury and surgery to carry on enjoying outdoor activities. Later Gordon provided great live entertaiment. 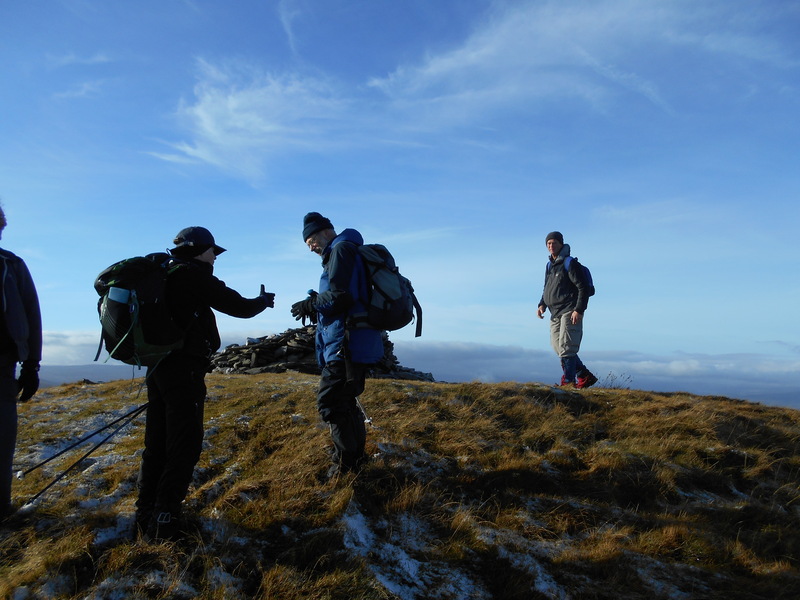 It was more of the same on the Sunday with 14 members walking in the Worlds End area and three members enjoying some navigation challenges as they ran around the local mountains (possibly due to the speed they were going?). 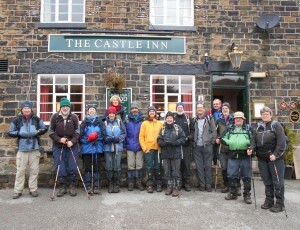 We stopped at the Castle Inn on the way for a pint. This is where the club was formed 47 years ago. Only Andy could ever remember meeting there, thankfully the rest of us are younger!! ( Sorry Andy). A few more joined us for the party at our house at the end, so it was rather cosy in our little terrace. Rosy had made a lovely cake for our anniversary, Steve brought sparkling wine and glasses for a toast, and everyone brought some grub along, so we all had a very nice time. 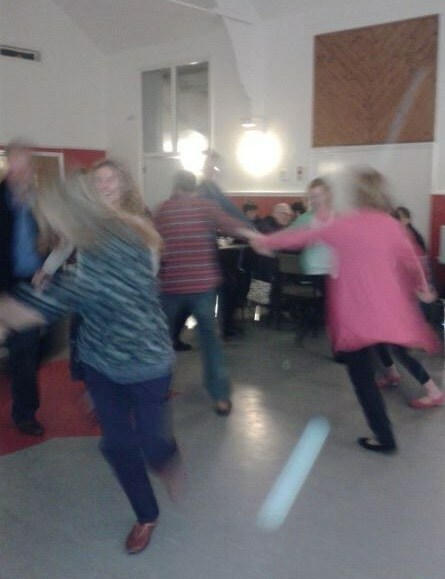 There was a very out at our Ceilidh on Saturday 8th November. The dancing started early and gathered momentum as the full compliment of 44 people filled the Broomhall Centre – a new venue for this event. A wide age range took part making the evening a real family affair. The Morgan Rattler, as ever, supplied energising and uplifting tunes and the tolerant caller (Lisa) delivered clear instructions for us and did not seem at all fazed by our ineptitude. Many people braved the dance floor and joined in with much enthusiasm. However, as usual, there were a few strays during Strip the Willow and the dosey does. Young Lana was very good at organising our group during a couple of the dances and made sure that we all towed the right line! During the interval we enjoyed a feast of some delicious savouries and desserts. Thanks go to Vanda for supplying paper goods, ensuring that we ate with some decorum. We are also very grateful to everyone who contributed a dish to share. 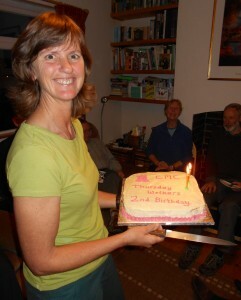 Linda was instrumental in selling raffle tickets and collected a great variety of prizes from local outdoor retailers and climbing walls including vouchers, rucksacks and books. 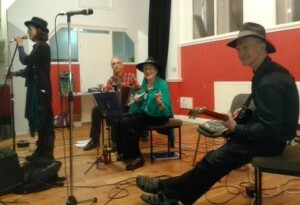 Thanks also to John, Gordon, Mike and Helen for help with prizes. We raised £227 for our chosen charity Edale Mountain Rescue.